It's important that your wedding reception facility provides the right environment in which to celebrate the joy of your Jewish wedding. Before you run around all over town looking for the perfect venue for your Jewish wedding, browse the halls listed below. 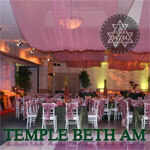 You'll narrow your search and find the right location for your Jewish wedding. For other occasions, such as Sheva Brachot, click here for smaller simcha halls and restaurants. Whether it's for 40 or for 400 of your closest friends and family, Temple Beth Am's beautiful facility featuring three state of the art Kosher kitchens, will provide the perfect setting. 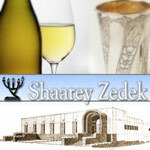 Shaarey Zedek congregation is the largest Orthodox congregation in the San Fernando Valley region of Los Angeles. We have newly remodeled facilities including with seating up to 350 guests. In the heart of Beverly Hills, Nessah Synagogue Simchah Hall has all the elements to make it the venue of choice for your wedding. The San Diego Marriott La Jolla has held many Jewish & Kosher Weddings and has Marriott certified wedding planners on property that can help you determine an overall vision for your wedding and help you execute each detail. The banquet spaces at the Marriott La Jolla are flexible enough to accommodate an intimate party or large gala. Hilton, Universal City, with its large wedding ballrooms, an RCC approved kosher kitchen and a creative catering team that will help you design a customized kosher wedding package is an ideal Jewish wedding venue. The legendary Luxe Hotels on Rodeo & Bel-Air offer beautiful indoor and outdoor settings for your celebrations. Kosher on-site and off-site catering. Plus all of our world-class amenities - luxurious rooms, tennis, gym, pool and spa. Herzog Wine Cellars is the perfect place to host your next event. We can accommodate small to large sized groups at our venue, which offers both indoor and outdoor locations. Our Chef, Todd Aarons, is always available to customize a menu that will suit your guests and your budget. A breathtaking lobby, few and varied ballrooms, the vibrant gardens, and our new RCC certified Glatt Kosher Kitchen make the Hilton at Los Angeles Airport just the venue for your wedding. Contact Jennifer Mowery, our Certified wedding specialist. Our beautiful catering hall, Kanner Hall, is located on our premises and available for private affairs, both on Shabbat and during the week: Shabbat kiddushes, Bar or Bat mitzvah parties, sheva brachot, brissim, banquets, and other social gatherings. Kanner Hall can hold up to 300 people with dance floor. Our two exclusive kosher caterers are: Judy's International (323) 934-7667 Pat's Catering (310) 205-8707 Please contact the caterers directly.